For I proclaim the name of the LORD; Ascribe greatness to our God! 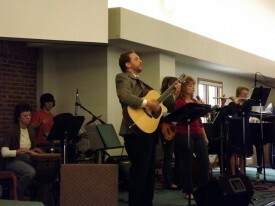 Proclaim is Cross of Christ’s praise team that leads weekly worship at the 11:15 a.m. contemporary service. Proclaim is adults and youth (6th grade and up) collaborating by singing and playing instruments in a variety of styles. Musical styles range from folk to top 40 Christian radio. New inquiries are always welcome.